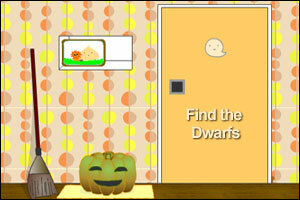 Find the Dwarfs is a new installment in the Japanese Room Escape Nekonote series. You find yourself in the same room as in Nekonote 8 – Exercice (well, almost the same) and the door is locked. Your will have to find a certain number of dwarfs and a key before you can get out of the room. 40 dwarfs are hidden in this room and the game features four different endings. Aaaah! It’s the return of the Most Hideous Wallpaper Ever! Run awaaaay!!! jojo is that the tv screen? I kept accidentally exiting and having to start over, so I finally just refused to get the key until after I’d found all the “dwarves”. 1/in the right corner of the door. 2/when you remove the mop one under it and one in the end of the stick of the mop. 2/in the pumpkin one inside it and the other one you can only see the legs of it. 1/left corner of the mirror. 1/look down when you are seeing the mirror you will find a tiny one. 2/in the cabinet 1 in the door of the cabinet and 1 behind the red doll. 2/when you open the window 1 above the curtain and one in down left corner of the window. a tiny one behind the right cat. 1/ beside the left cat. 2/above the 2nd P in happy AND IN THE RIGHT CORNER OF THE HAPPY HALLOWEEN SIGN. 2/under the tv 1 in the left corner. what an awesome game! Got 40 of em’ and beat it in no time! What’s up with those bats. Almost scared me half to death! I fell asleep and dreamed of being in the house, looking for these pests. Halloween n all! I found 38 on my own and 2 refer to walkthrough. Some are really difficult! I salute those who can find all 40 dwarfs on their own! in number 1 and 2 i followed the walkthru for ea and i could only find 39 in 1 and 2 . but i followed a walkthru from escape games 24 to do the number 2 (continuation) game but in that one i found all of them . Posted on Sunday, September 21st, 2008. Follow any responses through the RSS 2.0 feed.